No matter what the topic, whenever it comes to Doris Day music, rare or otherwise, one page is never enough. And so we pick up with more rare music here. 1954-1959 Beginning with the movies in 1954 and up through the early 60's, most of Doris' released music was associated with her immensely popular movies, which overshadowed her other records. These were the years for some of her biggest hits: "Secret Love", "If I Give My Heart To You" and "Que Sera, Sera", most of them introduced in a movie. But there were many really good singles that went by the wayside as the movies began to become the major focus for Doris. 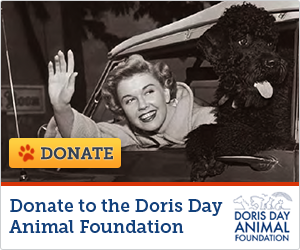 It is a sad fact, but true, that many people ONLY remember Doris for her movies; they either have forgotten the music or only remember one or two songs. Fortunately, many of these rare recordings have been posted on you tube for posterity. These follow after two which have not yet been posted. One features Doris with a Scottish brogue from the film "Lucky Me". It was the flip side of the hit single "I Speak to the Stars". The other has her singing "Love In a Home", backed by the Four Lads, a song from the Broadway Show, "Li'l Abner". 1960 AND BEYOND At the height of her film career (by 1960 Doris was #1 at the box office), the music became secondary. In fact, her last appearance near the top of the music charts was in 1958 with "Everybody Loves A Lover". That was also the year that Columbia Records released her "Doris Day's Greatest Hits" album, almost prophesying there would be no more. (That album is still in the Top 100 of the sales charts on amazon.com and has since been certified Gold.) Thankfully, Doris did hit the charts again but never in the Top Ten. (Noteable entries included: "Teacher's Pet", "Tunnel of Love", "Pillow Talk" and more notably "Move Over Darling", a certified hit in the U.K.) Many years later, in 2011, Doris released a new album called "My Heart", which was a big seller, especially in the U.K. The single from that also saw some action. It was called "Heaven Tonight". The album became the first one (with previously unreleased material) to hit the charts featuring an artist of Doris' age. Fans cannot say Doris was not still recording during the 60's. There were many popular album releases at the time. However, there were also some great singles that went by the wayside. A few of them became minor hits, but check out the gems below. All were recorded between 1963 and 1968 (some never released). In her very last single release, Doris sounds like she is actually apologizing to her fans for no longer being part of the on-going recording process. This one should have been a super hit, but in the late 60's, rock and roll and folk ruled the charts, and the general record buyers were no longer interested in Miss Day. So, Doris says: "sorry". If fans know or have heard of any other sadly-neglected songs by Doris, let us know at webmaster@dorisdaymagic.com. We will be very happy to find them (if possible) and put them right here.